The first in a series, this DVD covers the basic fundamentals of training with positive reinforcement. Detailed instructions on how to shape behavior with approximations (step by step instructions how to train your bird to step up, target, wave, etc.). Training subjects are companion parrots learning behaviors for the first time. Be the first to experience these special moments of learning captured on film. 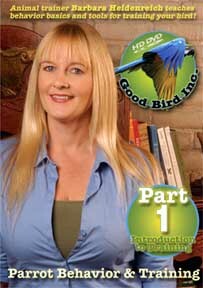 Click here for more information on the second DVD (Training Your Parrot) in this Good Bird series. Click here for more information on the fourth DVD (Get Your Bird Back) in this Good Bird series.